How was your day at school? A question many parents ask their children every day. However, if you are the parent of a child with significant verbal skills deficits, this can be a question you yearn to hear your child answer....even just once. Over the years I have worked with a variety of students with language and communication deficits. Most of the students with communication disorders I worked often had multiple diagnoses of Autism Spectrum Disorder or Down Syndrome. We all know how important it is to communicate with parents on our students progress and on their challenges. Thats a given. When a child has significant deficits in language and communication issues, such non verbal kids or kids with limited verbal skills, its even more important to be able to give the parents of these students a picture into the day their child had at school. What are some things we can do to foster communication skills and help parents get information about what went on at school. Here are a couple of ideas I have used in my classroom. This is an example of what might be on one page of the communication notebook. We used actually photos of the student because it worked best for him. One young man I had the pleasure to teach had several different sentences that he liked to say. We took those few sentences and built them into a communication notebook that he would use each day. First, it was only 1 sentence. It was a piece of paper with a picture at the top of him at PE. At the bottom was the sentence he like to use. Each day we had him read that sentence and say it to an adult. He loved seeing the picture of himself and this helped him to verbalize the sentence. 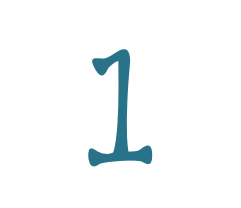 While the verbalization wasn't perfect, we accepted any approximation at first. 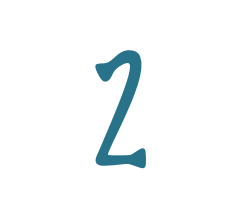 With consistent use and several months of using the conversation notebook, he became more consistent and actually enjoyed it. I LIKE RUNNING AT P.E. 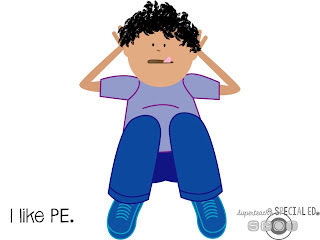 I LIKE PLAYING AT P.E. Yes, as you can guess, P.E. was a favorite activity so that is where we started. Each of these pages were put in a protective sheet and kept in a 3 ring binder. The protective sheets made it simple to switch out the pages as the sentences evolved and we added new sentences dealing with other parts of his school day. In class each day right before student dismissal time, we had an Afternoon Meeting. The purpose was for each student to summarize in some way what they liked, learned, or had a hard time with that day at school. 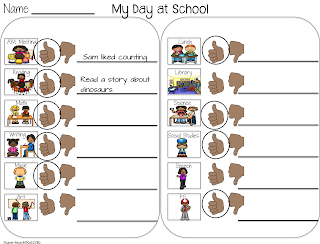 Everyone came to the group table and took turns showing, telling, pointing to verbal cue cards (whatever worked for each student) about their day. Using the communication notebook, this student could read/say the sentence of his choice for his contribution to the Afternoon Meeting. The notebook and the printed sentence gave him security of what to say and as the number of sentences increased, he was able to choose which one he wanted to use. When we had our afternoon meeting, sometimes I would have the parent come in and watch to see how their child could do this in our setting. It amazed the parent so much to be able to see the student participate in such a group and be able to share his information. The next step for me once we had the notebook working at school was to make the transition to the home setting. Since the parent had been in to observe how we use the notebook, this made the transition easier. Each day the notebook went home and the parent started using it in the same way to get him to use his words about what went on at school that day. 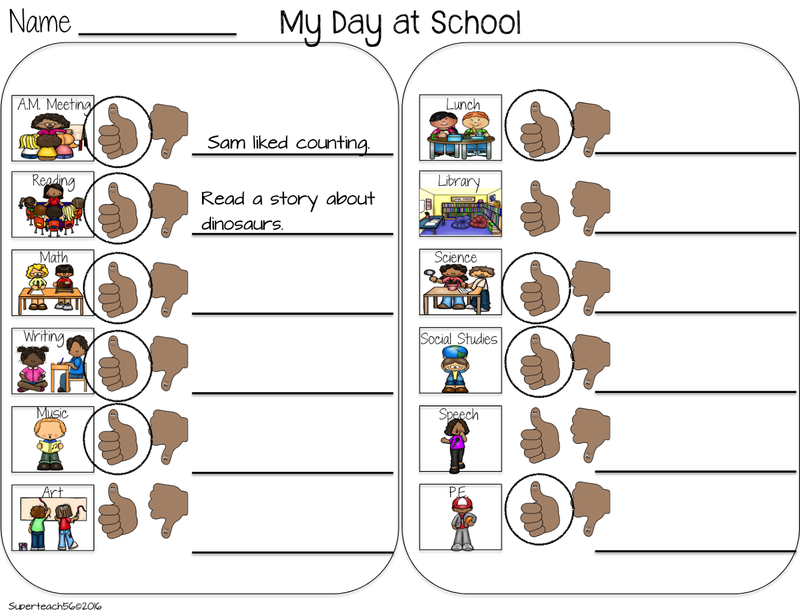 Another way to foster communication from school to home is a Communication Sheet. This sheet was used also at the end of the day in an Afternoon Meeting format. 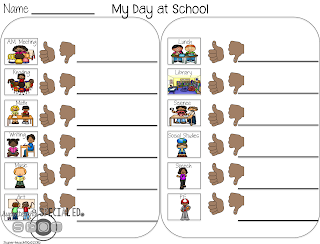 A child with very limited verbal skills was able to give a thumb up or thumbs down when asked if he did well/had fun/ learned something at each activity of the school day. Once the student selected a thumb up for good or a thumbs down for not so good, he circled the appropriate picture. 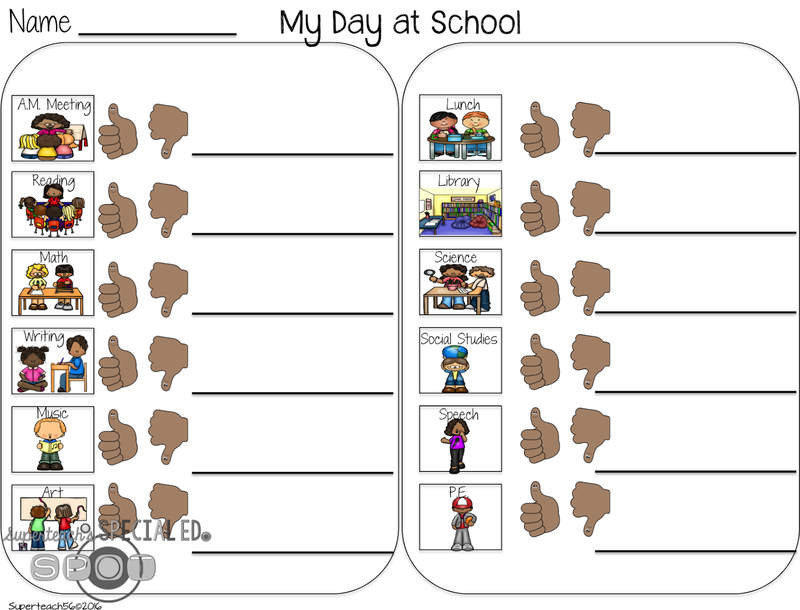 Then a teacher or paraprofessional would prompt him about what part of each activity he liked. The adult would then write a brief description or comment on the line about what the student liked. If the activity wasn't held on a particular day, then there was no circle on the thumb. This was sent home daily. 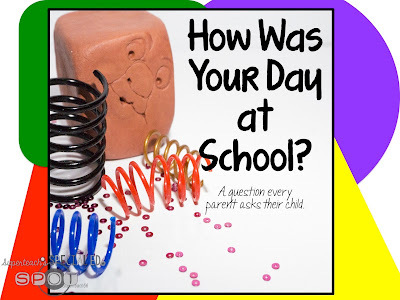 It provided the parent with an idea of what went on at school plus it provided the parent with some information they could use at home to ask the child about their school day. I used this type of Communication sheet for several years with a child that had great receptive language skills but could only nod, shake his head no or point.